. . .© john wheaver . . . . . Material may be reproduced from this site provided that credit is given. . . . . . . . . . . . . . . . . . . . . . . (Yes it really is john wheaver and not john weaver; on the + side there are not many of us). But who IS this? How much can you believe? Well, nobody of note; but he has accumulated some knowledge and pictures of Barbaresco and Barolo in over forty years of idle interest. This is no eulogy, but you might like to know where this material comes from. For a start it hasn't been gleaned from English writings - there were none for the first ten years - nor by being given swift tours of the area by local sages and retailing the views gathered. 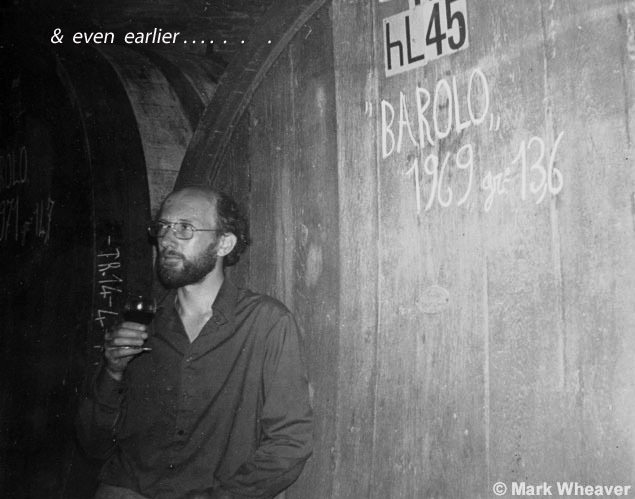 John Wheaver stumbled on Barbaresco and Barolo in 1967 driving back from Lucca with wife and one year old son. One cellar in each made impact on a lifetime. Why was this stuff not FAMOUS in England? During one of the enforced breaks in a 'career' as an Engineer he returned, now with one more small son, in a camper van in 1969, grew a beard ("barba"...) and visited twenty-two cellars in Barbaresco. ....................That's enough of that. Barbaresco in 1973 (WINE), The Nebbiolo of Piedmont in1974 (Wine and Spirit Trade), The Val d'Aosta in 1975 (Decanter), Barolo in 1978 (Decanter) and Roero in 1986 (Decanter); all with correctly captioned photos. Library pics? Again, there were none. Oh, and a poem - yes really! - Omaggio alle Langhe in Barolo & Co in 1986. Then - nothing. Even after getting a word processor, a car fit to bring back cases of wine from Le Langhe in each of the next twenty years and a decent camera. Or two. So it's a story of culpable inaction. No excuses. But then came the real fear that these wines of subtle and glorious personality might be dragged into the anonymous mass of international wine that is just "good" or even simply "great" which demanded some attempt at action. If it only tells producers of Barolo that many anglo-saxons want their wine to bear the proud stamp of the Barolo vineyard and not the smudgy anonymity of a foreign forest it will have some point. 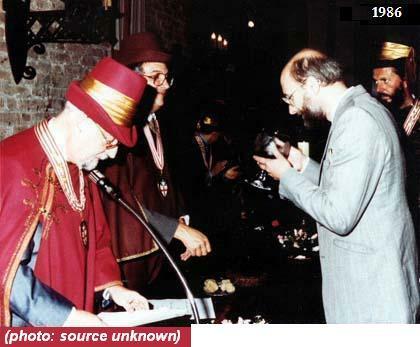 John was nominated to the Ordine dei Cavalieri del Tartufo e dei Vini di Alba in 1986 by Tino Colla and his brother Beppe who was a Past President of the Consortium of Barolo, Barbaresco (etc.) producers, and future Gran Maestro of the Cavalieri. 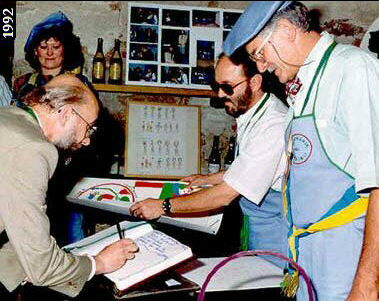 And in 1992 he was nominated as a member of the "Compagnia dei Vignaioli di La Morra" by Massimo Martinelli who was then President of the producers' Consortium. By 2006 he was still the only Briton to have become a member of either.